This dredger can pump up to 250 cubic yards of fill an hour. Concerned residents say it has been working off the north coast of Guana Cay every day since September 2015, including weekends and holidays. They fear the spoil is being used to fill in protected wetlands for the construction of high-end homes in the exclusive Baker’s Bay development. 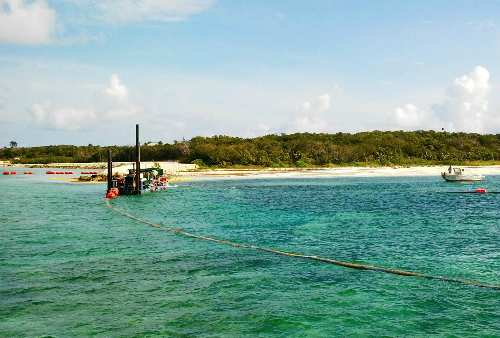 (Statement) Distraught residents are calling on the Ministry of Environment to urgently investigate a new round of dredging off the coast of Guana Cay, Abaco, which they fear is leading to the destruction of invaluable areas of protected wetland. Having been forced to watch helplessly while the fragile offshore reef system suffered extensive damage over the last five years due to the controversial Baker ’s Bay development, locals now want the government to step and save what is left of this once pristine island before it is too late. “Just when we thought it could get no worse, we find that the developers dredging at the north end of the island,” said Troy Albury, president of t he Save Guana Cay Reef Association (SGCRA). Albury noted that according to the law, permits must be issued for every dredging event in The Bahamas. He said residents want the authorities to verify whether or not this current work has the proper authorization. Albury said locals are unable to verify this for themselves, as for years they have been denied access to Baker’s Bay – and are even blocked from using a portion of the publicly owned Queen’s Highway that passes through the property. He said this anxiety has only been heightened by the developer’s continued neglect of several other obligations under the agreement. These include commitments to build a community center, reserve the water sports business exclusively for Bahamians, create a beach park, build a solid waste facility for the whole island, and provide housing for police officers. “In addition to that, there were also promises of environmental monitoring, and none of that ever came into play,” Albury said. From 2004 to 2009, the SGCRA, in conjunction with fast growing social and environmental movement Save The Bays (STB), mounted a groundbreaking legal campaign against the Baker’s Bay project, which elevated the issue of unregulated development to the level of national attention. STB chairman Fred Smith said Guana Cay is a perfect example of the destructive power of the “ Anchor Project” theory of national development, which ruins tradition communities, often without living up to the many promises made by the developers and the politicians who facilitate the deals.